The F4E Director together with the participants of the EIROforum Council meeting. Together with EIROforum science research members such as CERN and ESA, F4E Director Johannes Schwemmer participated at the EIROforum Council meeting. 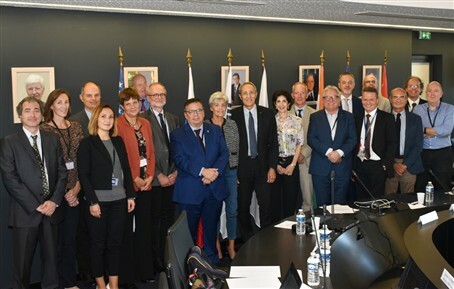 Chaired by EUROfusion and hosted by the ITER Organization, the meeting took place at the ITER Headquarters in Cadarache. ITER Director General Bernard Bigot presented the ITER project and its current status, which was followed by a discussion amongst the participants. Discussions relating more specifically to the work of EIROforum were also held and participants were also able to experience the ITER project up-close thanks to a tour of the site. EIROforum is the unified platform for CERN, EMBL, ESA, ESO, ESRF, European XFEL, EUROfusion and the Institut Laue-Langevin ̶ eight European organisations that form the backbone of fundamental science research in Europe. These organisations have extensive expertise in the areas of basic research and the management of large, international infrastructures, facilities and research programmes. EIROforum seeks to combine their resources, facilities and expertise to support European science in reaching its full potential. In addition, EIROforum simplifies and facilitates interactions with the European Commission, other organs of the European Union and national governments, as well as working closely with industry to foster innovation and to stimulate the transfer of technology.